On November 21, 2012, when Professor Huang Jiefu, Vice Minister of the Ministry of Health, was attending the Chinese Hospital Association Conference in Guangzhou, he was informed that there was going to be a DCD (Organ Donation After Cardiac Death) transplant operation in Lingnan Hospital of The Third Affiliated Hospital of Sun Yat-sen University. On hearing this, Huang decided to brave the rain and perform that liver transplant operation personally. He commented that this very operation was his support of the innovative reform taking place in Guangdong's public hospitals where the state-owned central hospitals shall gradually expand their services to the grassroots level. He also considered it as a practice of the appeal for voluntary organ donation after death, proposed by the Red Cross Society of China and the Ministry of Health together. Huang entered the operating theatre around 10 o’clock and got himself prepared for the surgery. 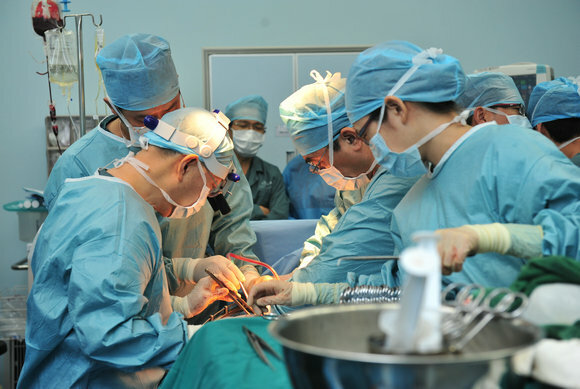 After preparation, Huang cooperated well with the team led by Professor Chen Guihua at the Transplant Center of the Third Affiliated Hospital of Sun Yat-sen University. The surgery finished up in success in the afternoon. It is learned that, there are already a large number of potential donors who are willing to donate their organs after death. Since the Ministry of Health and the Red Cross Society of China initiated the pilot project on March 2nd, 2010, the 38 pilot stations have received 465 cases of organ donation. Among them, Guangzhou station is the most exceptional one, with an incredible number of 126 cases. On the 8th of last October, when Lingnan Hospital in Luogang District was officially handed over to The Third Affiliated Hospital of Sun Yat-sen University, Huang Jiefu also attended its launching ceremony. He extolled this move as “a superb example of China’s public hospital reform”. "The Luogang Government built the houses, and Sun Yat-sen University provided the medical expertise and technology. They collaborated and helped the locals solve their health issues”, he remarked. I guess only those surgeons who are approved by that specific hospital can perform the surgeries or may be health minister had a previous record for successful transplants that is why he was permitted to do that.